To succeed on social media you need to get people engage with you! But that’s easier said than done! There are too many people on social media! The fight for attention is real! So how to achieve higher engagement on social media? 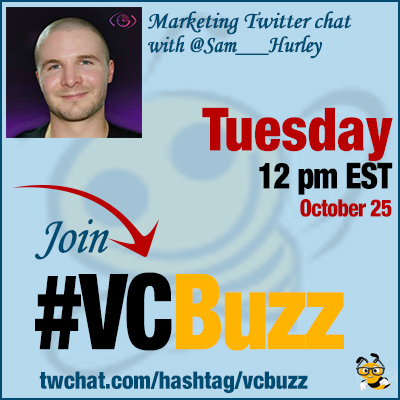 ***Add #VCBuzz chats to your calendar here. @Sam___Hurley is the global digital marketing influencer and social media marketer. He specializes in growth hacking, CRO, PPC and Analytics. Q1 How did you become a social media marketing expert and influencer? What’s your career path? Working both sides of the coin (in-house + agency) for companies small and very large, provided me with the necessary skills. I always loved #SEO but also delved into the entire scope of #DigitalMarketing. Then I built my personal brand in 15 months! Q2 Why is social media engagement so important? #SocialMedia is all about experience – not a one-way street for promotion. Nobody will listen if you’re just shouting! I’ve based my brand on a tightly-knit social community. These great people help each other + help me….without question. Aside from great relationships, engagement on #SocialMedia indicates influence. Influence = social proof. Social proof = sales. Q3 How to increase your engagement on social media? Guest blog on credible sites. Thank everyone who shares your material. Follow those you respect + strike up REAL conversation! Post industry-leading material. Not just your own! Curate great articles, send them out and mention the author + brand. #Use #hashtags #but #not #like #this! ? Research via @RiteTag to find the best hashes for your posts. Be selective! Post industry-leading material. Not just your own! Curate great articles, send them out and mention the author + brand. #BOOM! Don’t just send out posts. Spend hours each day actually COMMUNICATING with people! I do ??? It ignites your presence. Solidify relationships with #influencers who can propel you to new heights by sharing your material; #vcbuzz helps this process! Finally – experiment with #SocialMedia engagement ads!!! The visible interaction generates further organic engagement. Q4 Are the rules the same for brand accounts? How to get people engage with a brand on social media? Slightly different. Brand accounts need to be a tad restrictive – Professional personal accounts can display individualities. For engagement – no change in tactics. BUT: 92% of us trust recommendations from people…while only 33% trust brands! Q5 Social media is overwhelming! What are your favorite social media productivity tips? It certainly is! I turn off ALL notifications to avoid getting thrown off task. Then I check social platforms 3 times per day. Track your time! Use the digital productivity tool “@rescuetime” to analyse your activity each day. Hold yourself accountable! Use a social #CRM tool such as @nimble to effectively manage your relationships. I will be using it as I grow my brand! Be methodical. Use #SocialMedia for a reason. Don’t just treat it as an accessory. It is now a critical component of business! How I Tripled My Traffic with Viral Content Buzz: Our User’s Experience! Best Traffic Generation Tips from Content Marketing Experts + How #VCBuzz Can Help!